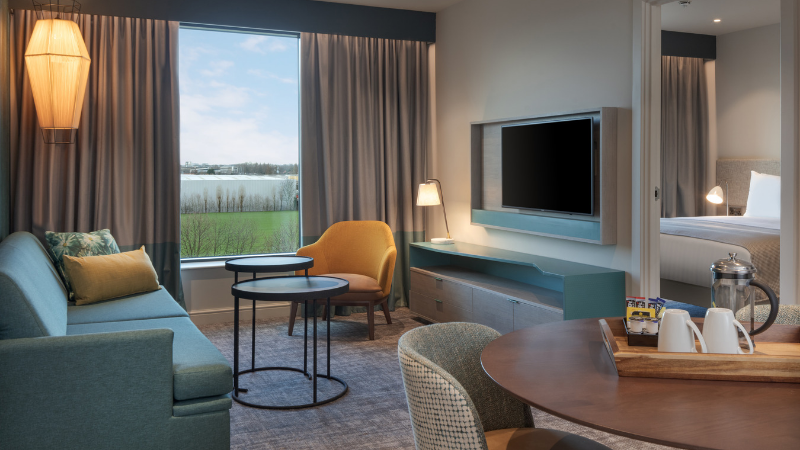 January 2019: IHG®, one of the world’s leading hotel companies, is proud to announce the opening of Staybridge Suites® London- Heathrow Bath Road, just minutes away from the international airport. Designed to meet the needs of guests who may be staying for extended periods of time, Staybridge Suites London- Heathrow Bath Road has 145 spacious studio rooms and 45 one-bedroom suites that are all equipped with a fully-fitted kitchen, allowing people to enjoy a flexible space to relax, play and work. As with all Staybridge Suites® hotels globally, the hotel has a pantry-style food store, called The Pantry, providing guests with everything from snacks and ready-made meals, to toiletries and washing detergent for the complimentary on-site laundrette. Staybridge Suites aims to make guests feel comfortable and welcomed while away from home. In line with the brand’s hallmarks, the hotel has stylish communal spaces throughout, complimentary 24-hour fitness and laundrette giving guests the flexibility to work, host meetings or relax. Every Tuesday – Thursday evening, guests are invited to join an Evening Social hosted by the hotel, to get together with friends or fellow travellers and unwind over complimentary food and drink. Room designs are kept neutral allowing guests the opportunity to personalise their space and make it their own. About Staybridge Suites®: Staybridge Suites®?is an innovative, all-suite hotel brand designed to meet the needs of extended stay guests who want to enjoy the best of home and hotel for business, relocation and vacations. Staybridge Suites has more than doubled in size in the past decade to over 263 conveniently located properties around the world. For more information, visit www.staybridge.com, connect with us on Facebook https://www.facebook.com/StaybridgeSuites/, Twitter https://twitter.com/staybridge or Instagram https://www.instagram.com/staybridgesuites/. About IHG®: IHG® (InterContinental Hotels Group) [LON:IHG, NYSE:IHG (ADRs)] is a global organisation with a broad portfolio of hotel brands, including Regent Hotels & Resorts, InterContinental® Hotels & Resorts, Kimpton® Hotels & Restaurants, Hotel Indigo®, EVEN® Hotels, HUALUXE® Hotels and Resorts, Crowne Plaza® Hotels & Resorts, voco™ Hotels, Holiday Inn®, Holiday Inn Express®, Holiday Inn Club Vacations®, Holiday Inn Resort®, avid™ hotels, Staybridge Suites® and Candlewood Suites®.